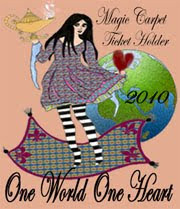 moonsplash designs...: One World One Heart ~ INTERNATIONAL Blog Hop! Please go here! OWOH Winner Announcement! It's time for a Magic Carpet Ride! Today is the Kick off for the One World One Heart Blog Hop! This is an INTERNATIONAL Blog Hop Event complete with giveaways all across the globe! All sorts of fabulous people are taking the time to "Hop" about and learn about each other, see their works, and just get to know your fellow man. In honor of OWOH, I will be giving away this Tattered Rose adornment! The winner will need to let me know if they would like for their rose flower to be transformed into a necklace, pin, or hair accessory! Cut off time for entries is Midnight, EST February 14th, 2010. The winner will be announced on February 15th, 2010. Have a wonderful time Blog Hopping!! What a pretty blog you have! This is the most beautiful rose. I simply love it. Pin (err, I mean pick) me, please. What a lovely rose. Please count me in. It'd be great if you could drop by my blog for a visit too. have fun!!! really pretty! thanks for your offering! That's a lovely rose - count me in on your OWOH giveaway! Great to meet you and please stop by blog. Great giveaway, please cound me in. If you have time come by mine too. What a wonderfully sparkly and tattered rose! That would look fabulous on a headband!!! I love pink and roses, so please count me in! how lovely, please do enter me! This is exactly what I was looking for to attach to the new black cloche type hat I just bought..beautiful! Wonderful giveaway that I would love to have! Please enter me! PS I'll be out of the country and away from the internet from the 14th-20th. If I am lucky enough to win, hold that prize for me!!! Pretty Please!!!! LOL! A lovely sparkling rose! I would love to be the winner! Please enter me! Be sure to come enter my OWOH giveaway too! P.S. Your blog is gorgeous and I've signed on to follow! Love all those spectacular flowers! Hello! So very pleased to make your acquaintance. Feel free to visit with me and take a trip upon my magic carpet! so beautiful! For the hair would be wonderful! please include my name! What a beautiful rose, please enter me in your drawing. Your blog is really pretty and gorgeous colors. So pretty! I'd love to wear it in my hair. Your tattered rose is just lovely, and if I'm lucky enough to win, I would love it in pin form, so that I could wear it on my purse, or jacket, or blouse, or anywhere! I'm off to check out the rest of your blog now! I would love the opportunity to win. What a beautiful rose, I would like it with a pin. Beautiful rose, I would love to be included in draw please. I'm loving how you've set up your blog. All the colors just made me smile. It's good to meet you! Have a very happy day! Hey girl! This is beautiful! I love your blog and your giveaway! Please take a moment to enter my giveaway too! What a lovely rose. My grand daughter would love it as a hair ornament. I have two cats too!! Thank you for hopping on the magic carpet! I hope you get a chance to visit my blog on your tour. Happy Blog HoP! What a pretty rose, it would be perfect for my dd's two-foot long hair when she wears it up. Looooove your blog. I'll have mine as a oin please ..so I can adorn my chapeaux! Love your blog! I would like to have a Tattered Rose adornment pin! Such a pretty colour! I would love to wear that! What a fantastic thing to giveaway! It is just so cute and elegant! What a beautiful hair adornment that would make. I'm giving away one of my fine art photographs over at my blog. I'd love for you to stop by. Oh how lovely! It would make a splendid pin or hair piece! Amy, your blog is *beautiful* and just the pick-me-up I needed after a dreary winter! I'd love the rose embellishment to be turned into a brooch of some sort- so I could pin it anywhere! I do hope you'll visit my blog where I'm giving away sets of paper banners! Lovely rose and it would look smashing in an updo, don't you think? Lovely blog and giveaway - if I were the lucky one I'd love to have it as a pin. I do hope you come and visit my blog too. your give away is so pretty I would love for it to be a necklace if i win. Oh... pretty rose. It would look great in my hair, I'm sure! I would love to win this. What a great giveaway! Nice to meet you. Don’t forget to come visit me too. I’m #391 on OWOH. Beautiful Rose!! Would make a great pin on me or my knitting bag. Please enter my name in your drawing :) What a FUN event...enjoy the ride!! great giveaway, I'd choose the necklace if I win. What a great idea for a pin. Please enter me in your drawing. That is such a beautiful rose. I hope I get to wear it someday. That is so pretty! It would make a lovely necklace. alas,I do not have a blog (yet). but I LOVE that rose,what a FAB pin it would be. Wow, what a response! Wonderful and I understand why, the flower is so creative! Hope you stop by my blog (again) www.scrapbookingsmiles.blogspot.com! Talk to you soon! Lovely Rose! Please add my name to the hat. Beautiful rose. I love it and I'd love to win it. I'd also love to learn how you worked with this type of fabric. I've enjoyed working with it, but have never done anything like this before. I'm amazed what you created. Clearly, you are very talented! This is so beautiful. Please enter my name..m.
Love your blog template! Isn't this all too much fun? What a beautiful giveaway! I think i'd have to go with something for my hair, because I don't wear jewelry much, and already have such a huge range of pins! And I have long hair, so am always wearing it up anyway!! Thankyou for doing such a wonderful prize for the winner! Fingers crossed it's me! Gorgeous! I would love this as a hair accessory! Such a pretty rose! Please count me in. Also, please stop by my blog and enter my OWOH giveaway when you get a moment; I'm #56. That is very pretty! I have tried to make ribbon roses but they didn't come out like that! Perfect for valentines day, your giveaway that is! Please count me in. I love your blog...It is so cool to meet folks from all over the world. very pretty rose. Please PICK ME to win in your giveaway drawing! thank you. Pretty! Please enter me in your giveaway and come on over to mine-#35 Thanks! I could be very sassy wearing this in my hair! I hope I win! what a gorgeous rose - I couldn't bear to call it tattered!!! I think that it would make a beautiful pin. What a beautiful rose!!! And a lovely blog. Count me in and thanks for participating! Beautiful rose, I think a pin would be great if I was to win! What a great looking rose! Count me in. Thank you for offering this giveaway. What fun. Please enter me. Please stop by and enter my give away as well! The rose is superb, what a great giveaway. Another wonderful blog on this incredible journey. What a beautiful blog....love the flowers you created. If I am lucky enough to win your wonderful rose I would love it as a hair accessory. Thanks for the chance. Gorgeous Blog,,,love all the Color!!! Your giveaway is precious!! Hope you are having as much fun with this as I am! Stop on by my little blog and enter!! I love the pin, it is just gorgeous. Oh can you teach me how to make your blog so dainty??? I like the rose, if I get picked I'd like a hair ornament for my wavy hair! I'm #615 hope you can drop by! what a pretty rose! glad to have found your blog! A lovely rose in your giveaway - I would like it as a brooch. :) Thank you for the chance to win in this magic carpet ride. I will stay and look around in your blog before I continue my journey. Take care! Greetings from Norway. I have been enjoying your blog and am looking forward to visiting again this year!! Wouldn't that look GREAT on my felted hat?! I'm number 211 on the magic carpet ride; come visit. Beautiful, so pretty. Would be great for vday coming up as well! Your rose is wonderfull, please count me in. So cute! I love flowers. Your flower is lovely! So nice. Hard to choose how I'd like to wear your pretty rose...but regardless it would be lovely to enjoy in person! I'm so glad that you are a part of One World One Heart this year! Please do enter my name in your giveaway and stop by my post as well, if you have not already had the chance. Love the rose, please enter me in your drawing!, ty! a beautiful giveaway, please count me in! I'd love it as a hair accessory! blog celebration & great giveaway, count me in!! What a lovely rose. I would love a chance to win. Please add my name to your drawing! Oh that would make a beautiful pin! The rose would make a beautiful pin, please include me in your giveaway. greetings from Canada. What a beautiful rose. And a lovely blog. Come visit me at my blog #593. I enjoyed reading your blog and learning a little bit about you. What a beautiful giveaway too. Please include me in your drawing. Warmest regards, Susan (ticket #775on the magic carpet ride)Isn't this fun! Beautiful!! I would be honored to win. A pin or wrist corsage would be the most wonderful joy for me! your beautiful rose would make a lovely pin/brooch, please would you count me in for a chance to win. Oh, I also sooo love the colours of your blog, so bright and welcoming. Gorgeous rose & beautiful blog too! Beautiful rose. Please enter me for a chance to win and stop by #234 on the magic carpet and see flowers made with paper. Hi Amy, what a lovely idea and post you have with the Tattered Rose Adornment. Your are so talented. I'd be delighted to win one of them. Please visit my blog, too, for a chance to win my book, 16 x MOM: A Mastery of Motherhood. My mom's name is Rose and would like to give it to her as a pin. I love this rose. It is perfect for one of my belly dancing outfits so I would love a hair ornament if I win. What a pretty flower! I'd love the opportunity to win it :) Isn't the Magic Carpet ride so fun? A lovely flower indeed it would make a pretty pin, please add me. I would love you to come over to my blog 599 when you get a minute. Swooping by on my magic carpet today. Your rose is beautiful..put my name in the hat please!! When you take your next ride please come by for a visit (#760)and look around..enter for one of my treasures. What a great give-away event!, you make beautiful things! Thanks for having us over to visit. Hi! It's so nice to meet you. Stop by and enter my giveaway when you have time. Your blog is really pretty and so is your giveaway! Please count me in. I just hopped on the magic carpet myself. Please come visit me at #818 Studio 64-Chicago for a chance at my giveaway. How cute! And your blog is beautiful! Please also stop by my blog to check out my giveaway. Wow!! Fabulous creations, please count me in!! We like similar things. Please visit my blog http://marr-haven.blogspot.com/ to see the felt flower brooch I am gifting. I'd love to win your OWOH offering! Pleased to meet you on this magic carpet ride. The rose is sumptious. I LOVE your ribbon roses! I make ribbon flowers too, amongst many other things! Hi there...what a lovely prize! Please enter my name in your drawing...then visit me at my blog, too!!! Be sure to visit me, too, if you haven't already...#168 on the list. Gorgeous rose, and what a lovely blog..
Oh my if I win this I would like it as a necklace or a pin if it is very large. I'm #736.